Having a large number of sufficiently abundant T cell clones is important for adequate protection against diseases. However, as shown in this paper and elsewhere, between young adulthood and >70 y of age the effective clonal diversity of naive CD4/CD8 T cells found in human blood declines by a factor of >10. (Effective clonal diversity accounts for both the number and the abundance of T cell clones.) The causes of this observation are incompletely understood. A previous study proposed that it might result from the emergence of certain rare, replication-enhancing mutations in T cells. In this paper, we propose an even simpler explanation: that it results from the loss of T cells that have attained replicative senescence (i.e., the Hayflick limit). Stochastic numerical simulations of naive T cell population dynamics, based on experimental parameters, show that the rate of homeostatic T cell proliferation increases after the age of ∼60 y because naive T cells collectively approach replicative senescence. This leads to a sharp decline of effective clonal diversity after ∼70 y, in agreement with empirical data. A mathematical analysis predicts that, without an increase in the naive T cell proliferation rate, this decline will occur >50 yr later than empirically observed. These results are consistent with a model in which exhaustion of the proliferative capacity of naive T cells causes a sharp decline of their effective clonal diversity and imply that therapeutic potentiation of thymopoiesis might either prevent or reverse this outcome. Individuals must maintain a large diversity of T cell clones to remain protected against a vast array of pathogens to which they are constantly exposed (1, 2). The CD8 subset of T cells contributes to the elimination of pathogens by killing infected cells displaying pathogen-derived Ags on their surface, whereas CD4 T cells are key regulators of these and other immune responses (3). The magnitude of the T cell response to a newly encountered Ag depends strongly on the frequencies of naive T cell clones that have specificity for that Ag (4, 5). However, the clonal diversity of naive T cells decreases with age (6–11), resulting in the loss of Ag-specific clones. This leads to a failure of the immune system to recognize certain Ags, including pathogen derived (12), and a higher probability that recognized Ags will subsequently acquire mutations that abrogate their recognition (13). Indeed, in certain strains of mice, as little as a 50% reduction in T cell diversity is sufficient to create large holes in the space of recognized Ags (14), thus impairing their ability to control certain infections. Although T cell cross-reactivity can in principle compensate for such holes, this does not happen in many of the cases that have been studied (2). Thus, an intriguing recent study showed that reducing clonal diversity by restricting the number of available TCRs results in severely impaired immune regulation and the development of colitis in mice (15). For human naive T cells, TCR sequence data (9, 11, 16) indicate that their effective clonal diversity (defined as the reciprocal of the probability that two randomly chosen T cells belong to the same clone) (17) declines sharply after the age of ∼70 years. Note that in contrast to measures of diversity that account only for the number of different T cell clones, effective clonal diversity accounts also for clone frequencies. It is important because the magnitude of the T cell response to an Ag depends not only on whether specific clones are present but also on the frequencies of such clones as well as how efficiently they are recruited into the response (4, 5). The mechanistic basis for the sharp decline of effective clonal diversity observed in old age is incompletely understood. A possible explanation is that the epithelial tissue of the human thymus starts to involute at the age of ∼1 year (18), which causes the number of new T cells that are subsequently produced by the thymus to decrease exponentially with age (9, 11, 19). However, computer simulations show that neither this exponential decrease in the rate of thymopoeisis nor the age-associated loss of T cells (20) is sufficient to elicit a dramatic decline of effective clonal diversity (21). An alternative explanation was recently proposed (21): that certain rare mutations might arise suddenly in particular T cells and allow them to outgrow other T cells, thus contributing to a sharp decrease in overall effective clonal diversity. In this paper, we propose a simpler explanation, based on the fact that a differentiated cell can undergo only a limited number of mitotic divisions under normal conditions (22). Specifically, differentiated diploid cells (e.g., T cells) that are in the resting (or quiescent) phase of the cell cycle occasionally enter the proliferation phase during which they divide. During cell division, the DNA replication machinery found inside each cell copies the cell’s chromosomes, except certain base pairs found at chromosomal ends called telomeres (23). Hence, each cell division shortens the telomeres (24, 25) until they reach a critical length (26, 27) that causes the cell to become replicatively senescent. (Note that there are other ways in which cells can become senescent without first exhausting their replicative capacity; e.g., see Ref. 28). Cells with such critically shortened telomeres are said to have reached the Hayflick limit (22, 29). Evidence that telomeres shorten as cells proliferate was initially obtained in human fibroblasts (22, 29) and later confirmed in other cell types, including naive T cells (30, 31). Although the enzyme telomerase can in principle extend telomeres during cell proliferation (32), its expression level is low in naive T cells and insufficient to prevent telomeres from shortening in activated T cells (33). Note that hematopoietic stem cell aging resulting in telomere attrition (34) might also contribute to the emergence of peripheral naive T cells with shorter telomeres. The fact that the emergence of these T cells in humans is accompanied by the loss of TCR excision circles (TRECs) indicates that homeostatic proliferation is an important cause of their shorter telomeres (35). Proliferating naive T cells leave the naive T cell pool by differentiating into memory cells or by attaining replicative senescence and subsequently being eliminated through both Ag-dependent (36) and -independent (28, 37) mechanisms. For example, replicatively senescent fibroblasts express signals that mark them for elimination, notably through phagocytosis (28). (In this study, we assume that replicatively senescent T cells also follow the same fate and that they are eliminated with 100% efficiency. Later, we will show that our conclusions are robust to a 1000-fold reduction of this efficiency.) Because the overall size of the naive T cell population is regulated such that it stays approximately constant (38, 39), a substantial T cell loss will trigger compensatory homeostatic proliferation of the remaining cells to fill the newly freed space. For example, Goldrath et al. (40) found that transgenic T cells transferred into C57BL/6 mice in which >95% of naive T cells had been removed through sublethal irradiation underwent a massive proliferation to fill the empty homeostatic space. In humans, T cell proliferation also increases after lymphopenia (41). Naive T cells that continue to proliferate will eventually reach the Hayflick limit. As these cells are eliminated, others will further proliferate to fill the space left empty and subsequently disappear. We propose that over time this dynamic will cause a chain reaction of cell loss, which will suddenly drive most T cell clones to extinction. In the following, we will demonstrate, using stochastic numerical simulations based on experimental data (18, 21, 22, 28, 29, 31, 38, 42–48), that this model provides a plausible explanation for the sharp decline of effective clonal diversity observed in elderly humans. We adapted our published bioinformatics pipeline (46) to analyze a large, previously published TCR sequence database (16) (dbGap accession number phs000787.v1.p1). The data were obtained via high-throughput TCR sequencing of samples of naive CD4 and CD8 T cells isolated from the blood of nine individuals aged 20–83 y. Five biological replicates of each donor’s CD4 and CD8 T cell samples were analyzed, resulting in a total of 90 paired-end nucleotide sequence read datasets. We used the paired-end read merger software (49) to merge the paired-end reads into single reads. We then mapped individual reads to reference TCRBV and TCRBJ gene segments found in ImMunoGeneTics (50) using the Smith–Waterman pairwise sequence alignment algorithm (51). This mapping provided the translation start site for each nucleotide sequence, allowing us to reconstruct the corresponding amino acid sequence. The CDR3 region of each sequence was defined as starting from the second conserved cysteine found near the 3′ end of TCRBV, and ending at the 5′ conserved phenylalanine of TCRBJ. We clustered CDR3 nucleotide sequences assigned the same Vβ and Jβ gene segments to correct up to 2 nucleotide misincorporation errors that occurred during the sequencing reaction, using the following steps: 1) the sequence with the most identical copies was chosen to seed a new cluster, and 2) unclustered sequences with ≤2 nucleotide differences from the cluster seed were added to the cluster. These steps were repeated until all sequences were clustered. We used an adaptation of Simpson’s index applicable to replicate sequence datasets (52) to quantify the effective diversity of all inframe CDR3 amino acid sequences corresponding to the cluster seeds. We defined effective diversity as the number of equally abundant sequences that will give a particular value of Simpson's index, which is mathematically equivalent to the reciprocal of this index (17). Human naive T cell population dynamics were simulated, starting at the age of 20 y and continuing until 100 y. We sampled each T cell clone i from the geometric distribution G(i) = φ (1 − φ)i/(1 − [1 − φ]S) (21), with bias parameter φ = 0.01. The maximum size of the T cell population was set to K = 5 × 105 cells, whereas the total number of possible clones was set to S = 1 × 103, as in previous work (21). With these values of K and S, each clone had an average starting size of K/S = 500, corresponding to an initial number of cell divisions of log2(500) = 9. This is in line with the empirical estimate of 11 T cell divisions by the age of 20 y, which we obtained by assuming that each T cell loses ∼75 bp of telomere/division (31), and a total of ∼20 × 40 bp = 800 bp are lost by the age of 20 y (48). As an illustration of how φ affects clonal distributions, we note that the expected size of clone 1 in the initial T cell population is K × G(1)= 5 × 105 × 0.01 × (1 − 0.01)1/(1 − [1 − 0.01]1000) = 4950 cells when φ = 0.01, but it is only 525 cells when φ = 10−4. Note that we obtain qualitatively similar results even if φ is as small as 10−4, representing an approximately unbiased clonal distribution. Also, note that increasing K will not change our results as long as S is also increased to maintain the starting clone size. Other parameters used in the simulation are described in Results. The simulation algorithm was implemented in R (53) and is available from W. Ndifon. (1)From equation 1, the expected time at which the average number of cell divisions for all T cells will be equal to the Hayflick limit H can be approximated as tc = H/δt + 1/r. Substituting the values of H, r, and δt used in the simulations into this equation, we find that tc = ∼125 y. We develop a simple mathematical instance of our simulations of T cell population dynamics. We assume that naive T cells divide synchronously at defined cell cycling time intervals. The number of T cells that are in the resting phase at the time interval t is denoted Nt. Resting T cells with state x enter the proliferation phase at the average rate βt. By “state” we mean characteristics of a T cell (e.g., its Ag specificity and expressed cytokines) that are important for its homeostasis. A T cell with state x that enters the proliferation phase either divides, thereby producing two daughter cells with the same state, or is lost with a probability μt(x), if it has already reached the Hayflick limit (22, 29). (<1/2) denotes the expected value of μt(x). We proposed earlier that the Hayflick limit determines the sharp decline of effective clonal diversity observed in individuals aged > 70 y. In this study, we use numerical simulations to further assess the deductive validity of this proposal. We begin by examining the empirical variation of effective clonal diversity with age. We use a large database of CDR3 amino acid sequences (16) from the TCR β-chain to estimate how the effective number of naive CD4 and CD8 T cell clones found in human blood varies with age (Materials and Methods). T cell clonal diversity is mostly determined by variability of the TCR, the largest contribution to which is made by the CDR3 region of the TCR β-chain (54). Thus, we use the effective diversity of CDR3 amino acid sequences as a lower bound for the effective clonal diversity of T cells. (This estimate is a lower bound because it does not capture the diversity contained outside of the CDR3 region of the TCR β-chain. Nevertheless, the relative change in this estimate should reflect the relative change in clonal diversity). By analogy with the estimation of effective species diversity in ecology (17), we define the effective diversity of CDR3 amino acid sequences as the reciprocal of the probability that any two sequences randomly chosen from the same individual are identical. We find that effective clonal diversity decreases significantly with age, for both naive CD4 (correlation coefficient: −0.70, p = 0.0043; Fig. 1, left panel) and naive CD8 (correlation coefficient: −0.95, p = 0.0049; Fig. 1, right panel) T cells. For naive CD4 T cells, we estimate that there are ∼2.0 × 106 (standard error [s.e.] 7.5 × 105) CDR3 sequences in young adults aged 20–35 y but only ∼1.7 × 105 (s.e. ∼3.6 × 104) in elderly individuals aged 70–83 y (Fig. 1, left panel). Similarly, there are ∼2.0 × 106 (s.e. ∼2.1 × 105) naive CD8 T cell CDR3 sequences in young adults but only ∼7.5 × 104 (s.e. ∼5.8 × 104) in the elderly (Fig. 1, right panel). This indicates that there is a ∼ 10 (respectively [resp.] ∼ 30) fold decline in the effective clonal diversity of naive CD4 (resp. CD8) T cells in elderly individuals compared with young adults. For CD8 T cells, this decline is ∼ 125 fold when one outlying elderly individual (who has an exceptionally high effective number of CDR3 sequences) is removed from the analysis. 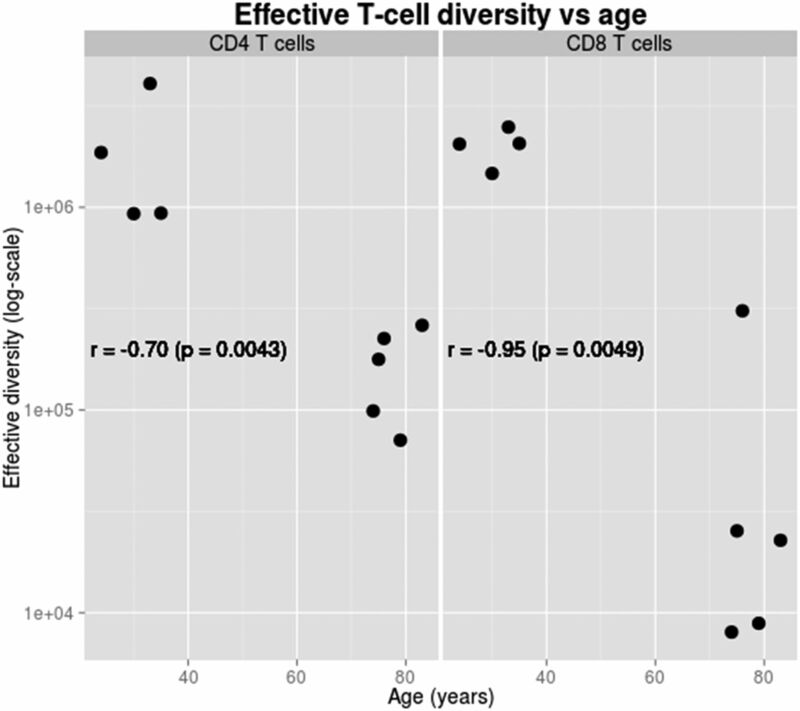 Effective clonal diversity of naive T cells declines with age. We used five replicate TCRB CDR3 amino acid sequence datasets (16) from both naive CD4 (left panel) and CD8 (right panel) T cells to estimate effective clonal diversity (Materials and Methods). r denotes the correlation coefficient between effective clonal diversity and age. Each p value was computed by permuting randomly the corresponding estimates of effective clonal diversity and then comparing the resulting correlation coefficient to that obtained using unpermuted estimates. Simulations predict a sharp decline of effective clonal diversity. To assess our proposed explanation for the sharp decline of effective clonal diversity observed in old age, we simulate the population dynamics of naive T cells found in the peripheral lymphoid organs of a human (e.g., the blood and spleen), starting in early adulthood (∼20 y), when the total size of the T cell population is expected to be under homeostatic control (38). Because the thymic epithelium involutes before adulthood (18), the rate at which new T cells are produced by the thymus decreases exponentially with age so that it becomes negligible after ∼40 y (9, 11, 19). Therefore, the dynamics of the adult human T cell population is largely determined by changes to existing T cells and not by thymic production of new T cells (55). Note that in the following analyses we do not assume that thymopoesis ceases after the age of 40 y. Previous studies have approximated the rate of thymopoiesis by measuring the abundance of TRECs. Mathematical modeling indicates that TREC abundance depends not only on thymopoeisis but also on T cell proliferation and death (56, 57). Nevertheless, with the exception of one study (58), most others (9, 35, 55, 59) indicate that TREC abundance declines with age in accordance with the rate of thymic involution described by Steinmann et al. (18). Like previous researchers (21, 57), we assume that this rate of thymic involution implies a comparable rate of decline of thymopoiesis beginning in early adulthood. We initialize each simulation with a population of K naive T cells, each sampled randomly from S possible distinct T cell clones. We sample individual clones from the distribution G(i), where i, i = 1,...,S, is a clonal index, and G(i) is the expected frequency of clone i. Empirical data indicate that different clones have very different a priori production frequencies (60), with the fold difference between the highest and lowest frequencies being on the order of 104 (46, 47). This implies that G(i) must be highly biased. The one-parameter geometric distribution fits reasonably well the experimentally measured frequencies of T cell clones expressing different TCR β-chains (61). Therefore, to investigate the effects of bias, we set G(i) equal to the following geometric distribution with bias parameter φ (21): G(i) = φ (1 − φ)i/(1 − [1 − φ]S). This distribution is approximately uniform (i.e., unbiased) for very small φ, but it is biased in favor of clones with small indices for larger φ. We use a value of φ for which the ratio of the highest to the lowest clone frequencies is ∼104—i.e., φ = 1 − 104/(1 − S). We will show that similar results are produced by using a smaller value of φ, for which G(i) is approximately uniform (i.e., unbiased). , with T = 33.33 yr (18) and τ = 0.0017 d−1 (21). In addition, experiments indicate that the daily turnover rate of naive T cells in adult humans ranges from ∼0.1 to ∼0.2% (42–44). A much lower estimate of the T cell turnover rate was previously reported (62), but a mathematical model that fits the same experimental data much better yields an estimate that is consistent with those cited above (45). Therefore, we assume that T cells are lost from the population at the average rate δt = 0.15% day−1. T cells are also lost if they have divided >50 times, which is the Hayflick limit (22, 29). To simulate homeostasis (38), by maintaining the T cell population's size at time t, Nt, at the carrying capacity K, each T cell is replicated with probability rate βt = (1 – Nt/K), producing another cell with the same clonality as the parent cell. (By carrying capacity we mean the maximum T cell population size that an individual normally supports.) Further details about the simulations are described in Materials and Methods. We quantify the effective clonal diversity of the T cell population using the reciprocal of the Gini–Simpson diversity index (17). We calculated the effective clonal diversity of the simulated T cell population once every 90 d during the time period from t = 20 to t = 100 y. In addition, we also calculated both the average rate of T cell homeostatic proliferation and the average number of T cell divisions at each of these time points. The results are plotted in Fig. 2. 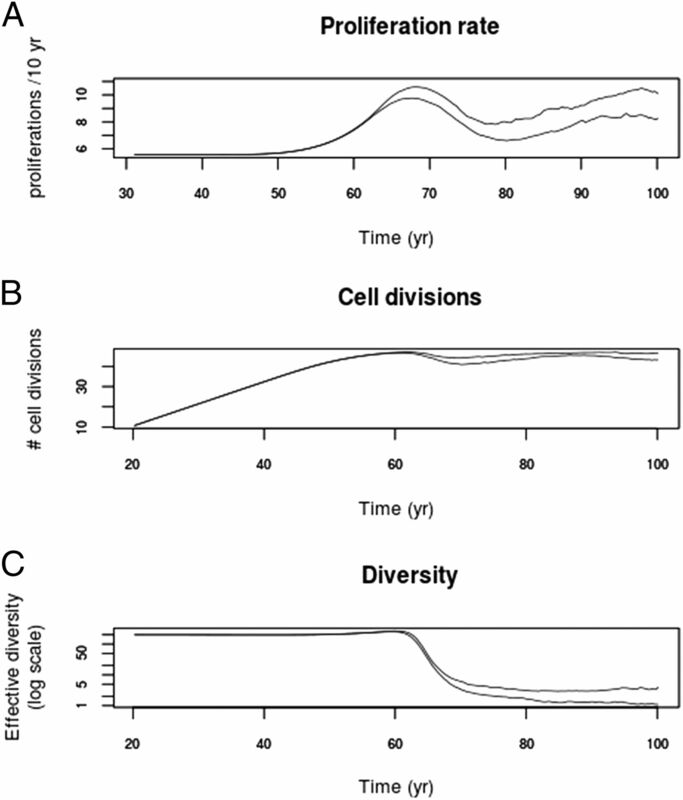 Simulations predict sharp decline of effective clonal diversity. We simulated the population dynamics of human naive T cells as described in the text and Materials and Methods, based on experimental estimates of the Hayflick limit (22, 29), the bias in thymic production of different T-cell clones (46, 47), and the rates of thymopoeisis (9, 18, 19, 21), T cell turnover (42, 43, 45), and telomere attrition (31, 48). We set the bias in thymic production of different T cell clones to φ = 0.01. We ran the simulations 100 times and plotted the dynamics of the upper and lower 25 percentile values of the following: (A) the mean number of proliferations accrued by each T cell during the preceding decade; (B) the mean number of T cell divisions accrued during the lifetime of each T cell and its ancestors; and (C) the effective clonal diversity of the T cell population. The effective clonal diversity is plotted on a log scale. The results show that the average proliferation rate of individual naive T cells βt increases with age (Fig. 2A), in agreement with data obtained from both humans (9) and rhesus macaques (7). The increase in βt is initially very slow, but it eventually accelerates after the age of ∼60 y, coincident with the approach of the average number of cell divisions toward the Hayflick limit (Fig. 2B). Indeed, the average number of proliferations per T cell per decade doubles between the ages of 30 and 70 y and it subsequently oscillates (Fig. 2A). This is accompanied by a dramatic increase in the abundance of a small subset of T cells, whose total relative abundance is ∼100% at the age of 60 y. Importantly, effective clonal diversity declines to less than a tenth of its initial value after ∼70 y (Fig. 2C). The results are consistent with experimental data (9) showing that naive CD4 T cell proliferation rate doubles after the age of 70 y coincident with a sharp decline of T cell diversity. These results, which were obtained by assuming that there is a strong bias in the production frequencies of different T cell clones (i.e., φ = 0.01) consistent with empirical data (46, 47, 60), are similar to results obtained without such bias (Supplemental Fig. 1). In addition, we obtain similar results as shown in Fig. 2 by assuming that replicatively senescent T cells are eliminated from the human body at the rate of only 0.1% day−1, which is 1000-fold lower than we assumed earlier (Supplemental Fig. 2). In this case, we see that the frequency of senescent cells increases over time, reaching a maximum at ∼80 y of age and cycling thereafter (Supplemental Fig. 2D). Interestingly, T cell diversity still drops sharply after ∼70 y in line with the results reported earlier (Supplemental Fig. 2C). Thus, in our model, even if the process of eliminating senescent cells has a very low efficiency, T cell diversity still drops sharply in accordance with empirical observations. Taken together, our data are consistent with the proposal that the Hayflick limit, or a peripheral T cell maintenance limit, is an important determinant of the effective clonal diversity of naive T cells. Increased homeostatic proliferation is necessary for sharp decline of diversity. We note that an increased rate of homeostatic proliferation of T cells because of the loss of senescent T cells is an essential requirement for a significant decline in effective clonal diversity to occur around the eighth decade of life. Without this increase, the expected time at which the average number of cell divisions for all T cells will be equal to the Hayflick limit is estimated to be 125 y (Materials and Methods), which is >50 y longer than the value predicted by the simulations and observed empirically. Therefore, a sufficient increase in βt is necessary to produce a sharp decline of effective clonal diversity during the normal lifespan of a human. The increase in βt that is predicted by the simulations is further supported by a simple mathematical model of T cell population dynamics (Materials and Methods). First, the model makes the intuitive prediction that βt will increase as the size of the thymic output falls (equation 3). A corollary to this prediction is that a larger thymic output size will slow down the rate at which individual T cells reach the Hayflick limit and subsequently become extinct. Second, the model predicts that βt will also increase as the average probability that individual T cells have reached the Hayflick limit at time t increases. Indeed, βt is predicted to grow infinitely large in the limit as this average probability reaches the critical value 1/2. Data obtained from a variety of species (6–11, 16) indicate that the effective clonal diversity of T cells declines with age. Using CDR3 amino acid sequences obtained from the TCR β-chain (16), we estimated the age-dependent change in the effective clonal diversity of naive CD4/CD8 T cells found in human blood (Fig. 1). We found that between young adulthood (20–35 y) and old age (70–83 y), the effective clonal diversity of naive CD4 (resp. CD8) T cells decreased by a factor of ∼10 (resp. ∼30) (Fig. 1). For CD8 T cells, when one outlying elderly individual was not considered in the analysis, effective clonal diversity decreased by ∼125-fold. In particular, the effective number of CD8 CDR3 amino acid sequences was ∼2 million in young adults, but only ∼16,000 in the elderly (Fig. 1). The diversity of the CDR3 region might be affected by an individual’s gender as well as by chronic infections, most notably CMV. We obtained the results reported in this paper using CDR3 amino acid sequences collected by Goronzy and coworkers (16), which came from four younger and five older individuals. The genders of these individuals are unknown, so we cannot evaluate the potential effect of gender on our estimates of diversity. Several of the older individuals tested negative for Abs to CMV, so it is unlikely that the sharp drop in T cell diversity that we measured in these individuals is mainly because of CMV. Because the CDR3 region is important for Ag recognition (2), our results imply that, compared with young adults, elderly individuals are much less able to recognize a diverse ensemble of Ags, including pathogen derived. We predicted, using a population-dynamic modeling approach based on experimental data (18, 21, 22, 28, 29, 31, 38, 42, 43, 46–48), that the markedly lower effective clonal diversity found in elderly humans results from the fact that each T cell can divide for only a limited number of times before it reaches replicative senescence (or the Hayflick limit) (29, 63) and is consequently eliminated (28, 36, 37). This, coupled to the facts that thymic production of new T cells declines substantially with age (11, 18, 19) and that T cells will undergo compensatory proliferation (38, 40, 64) to fill the empty homeostatic space created by the loss of senescent cells, leads to a sharp fall in effective clonal diversity at approximately the same time as was empirically observed (Fig. 2C). These results are robust to substantial variations in the assumed bias in thymic production of T cell clones (Supplemental Fig. 1) and in how efficiently senescent cells are eliminated from the body (Supplemental Fig. 2). Both stochastic numerical simulations and mathematical modeling predicted that the sharp decline of effective clonal diversity is precipitated by a progressive increase in the rate of T cell proliferation (Fig. 2A). This observed increase in the T cell proliferation rate is in general agreement with empirical data showing that, in comparison with young adults, the naive T cell turnover rate in elderly humans either doubles (9) or does not change significantly in the CD4 compartment (65), and it increases by ∼3-fold in the CD8 compartment (65). An increase in T cell proliferation at old age has also been observed in rhesus macaques (7). Although this increase is predicted to be initially slow, it accelerates after the age of ∼60 y as the average number of T cell divisions approaches the Hayflick limit (Fig. 2A, 2B). A previous study proposed an alternative explanation for the decline of effective clonal diversity observed in old age, namely that it might be caused by replication-enhancing mutations that arise suddenly in certain T cells (21). This earlier proposal suggests that opportunities for therapeutically preventing an eventual decline of effective clonal diversity are quite limited (21). In contrast, the simpler explanation proposed in the current study paints a more hopeful picture: It might be possible to maintain a more clonally diverse naive T cell repertoire through therapeutic interventions that increase thymopoiesis. It is worth noting that in addition to the Hayflick limit and replication-enhancing mutations (21), increased proliferation of naive T cells might also occur as a result of differences in the reactivity of T cells with self-peptide MHC. In aged mice, the CD8 T cell repertoire is biased in favor of T cells with a high avidity for self-peptide MHC (8). These T cells preferentially undergo homeostatic proliferation, leading to a contraction of T cell repertoire diversity in aged mice (8). Numerical simulations (21) suggest, however, that this unequal homeostatic proliferation rates alone may be insufficient to cause the sharp decline of T cell diversity observed in elderly humans. Previous studies have implicated chronic exposure to pathogens such as CMV, EBV, and HIV in the accumulation of replicatively senescent T cells during human aging (66). An increased frequency of such senescent cells might restrict further immune responses to pathogens (67). The present study indicates that senescent T cells may also emerge frequently from the normal process of homeostatic T cell proliferation. Furthermore, their emergence was shown to coincide with the marked decline of the effective clonal diversity of naive T cells that occurs in elderly humans. The results support a model in which exhaustion of the proliferative capacity of naive T cells is a key trigger for the subsequent sharp decline of their effective clonal diversity (68). We thank Nir Friedman for his constructive comments on an earlier version of this manuscript. This work was supported by a grant from the Canadian International Development Research Center to the African Institute for Mathematical Sciences.
. 2002. Direct link between mhc polymorphism, T cell avidity, and diversity in immune defense. Science 298: 1797–1800.
. 2004. The many important facets of T-cell repertoire diversity. Nat. Rev. Immunol. 4: 123–132.
. 2011. Janeway’s Immunobiology. Garland Science, New York.
. 2012. The role of naive T cell precursor frequency and recruitment in dictating immune response magnitude. J. Immunol. 188: 4135–4140.
. 2010. Primary CTL response magnitude in mice is determined by the extent of naive T cell recruitment and subsequent clonal expansion. J. Clin. Invest. 120: 1885–1894.
. 2009. Clonal expansions and loss of receptor diversity in the naive CD8 T cell repertoire of aged mice. J. Immunol. 182: 784–792.
. 2007. Dramatic increase in naive T cell turnover is linked to loss of naive T cells from old primates. Proc. Natl. Acad. Sci. USA 104: 19960–19965.
. 2011. Nonrandom attrition of the naive CD8+ T-cell pool with aging governed by T-cell receptor:pMHC interactions. Proc. Natl. Acad. Sci. USA 108: 13694–13699.
. 2005. The influence of age on T cell generation and TCR diversity. J. Immunol. 174: 7446–7452.
. 2013. CD4+ T cell-receptor repertoire diversity is compromised in the spleen but not in the bone marrow of aged mice due to private and sporadic clonal expansions. Front. Immunol. 4: 379.
. 2007. Aging and T-cell diversity. Exp. Gerontol. 42: 400–406.
. 2008. Age-associated decline in T cell repertoire diversity leads to holes in the repertoire and impaired immunity to influenza virus. J. Exp. Med. 205: 711–723.
. 2004. Limited T cell receptor diversity of HCV-specific T cell responses is associated with CTL escape. J. Exp. Med. 200: 307–319.
. 1991. Limitations in plasticity of the T-cell receptor repertoire. Proc. Natl. Acad. Sci. USA 88: 9503–9507.
. 2015. Requirement of full TCR repertoire for regulatory T cells to maintain intestinal homeostasis. Proc. Natl. Acad. Sci. USA 112: 12770–12775.
. 2014. Diversity and clonal selection in the human T-cell repertoire. Proc. Natl. Acad. Sci. USA 111: 13139–13144.
. 2013. Measuring and estimating species richness, species diversity, and biotic similarity from sampling data. Encycl. Biodivers. 5: 195–211.
. 1985. The involution of the ageing human thymic epithelium is independent of puberty. A morphometric study. Scand. J. Immunol. 22: 563–575.
. 1995. Age, thymopoiesis, and CD4+ T-lymphocyte regeneration after intensive chemotherapy. N. Engl. J. Med. 332: 143–149.
. 2014. Aging and cytomegalovirus infection differentially and jointly affect distinct circulating T cell subsets in humans. J. Immunol. 192: 2143–2155.
. 2012. Peripheral selection rather than thymic involution explains sudden contraction in naive CD4 T-cell diversity with age. Proc. Natl. Acad. Sci. USA 109: 21432–21437. 1965. The limited in vitro lifetime of human diploid cell strains. Exp. Cell Res. 37: 614–636. 1972. Origin of concatemeric T7 DNA. Nat. New Biol. 239: 197–201.
. 1990. Telomeres shorten during ageing of human fibroblasts. Nature 345: 458–460.
. 1998. Extension of life-span by introduction of telomerase into normal human cells. Science 279: 349–352.
. 2001. The shortest telomere, not average telomere length, is critical for cell viability and chromosome stability. Cell 107: 67–77.
. 2004. Does a sentinel or a subset of short telomeres determine replicative senescence? Mol. Biol. Cell 15: 3709–3718.
. 2014. Cellular senescence: from physiology to pathology. Nat. Rev. Mol. Cell Biol. 15: 482–496.
. 1961. The serial cultivation of human diploid cell strains. Exp. Cell Res. 25: 585–621.
. 2011. Age-related deregulation of naive T cell homeostasis in elderly humans. Age (Dordr.) 33: 197–207.
. 1995. Human naive and memory T lymphocytes differ in telomeric length and replicative potential. Proc. Natl. Acad. Sci. USA 92: 11091–11094.
. 2002. Human telomerase and its regulation. Microbiol. Mol. Biol. Rev. 66: 407–425.
. 1996. Mechanism of telomerase induction during T cell activation. Exp. Cell Res. 228: 58–64.
. 1994. Evidence for a mitotic clock in human hematopoietic stem cells: loss of telomeric DNA with age. Proc. Natl. Acad. Sci. USA 91: 9857–9860.
. 2008. Homeostasis of the naive CD4+ T cell compartment during aging. J. Immunol. 180: 1499–1507.
. 2003. Expression of CD57 defines replicative senescence and antigen-induced apoptotic death of CD8+ T cells. Blood 101: 2711–2720. 2002. Decoding the patterns of self and nonself by the innate immune system. Science 296: 298–300.
. 2000. Population biology of lymphocytes: the flight for survival. Annu. Rev. Immunol. 18: 83–111.
. 2009. Naive T cell homeostasis: from awareness of space to a sense of place. Nat. Rev. Immunol. 9: 823–832.
. 2000. Naive T cells transiently acquire a memory-like phenotype during homeostasis-driven proliferation. J. Exp. Med. 192: 557–564.
. 2012. Lymphopenia-driven homeostatic regulation of naive T cells in elderly and thymectomized young adults. J. Immunol. 189: 5541–5548.
. 2009. Quantifying the development of the peripheral naive CD4+ T-cell pool in humans. Blood 113: 5480–5487.
. 2004. Rapid turnover of effector-memory CD4+ T cells in healthy humans. J. Exp. Med. 200: 255–260.
. 2013. Quantifying T lymphocyte turnover. J. Theor. Biol. 327: 45–87.
. 2013. Closing the gap between T-cell life span estimates from stable isotope-labeling studies in mice and humans. Blood 122: 2205–2212.
. 2012. Chromatin conformation governs T-cell receptor Jβ gene segment usage. Proc. Natl. Acad. Sci. USA 109: 15865–15870.
. 2009. Comprehensive assessment of T-cell receptor β-chain diversity in αβ T cells. Blood 114: 4099–4107.
. 1993. Loss of telomeric DNA during aging of normal and trisomy 21 human lymphocytes. Am. J. Hum. Genet. 52: 661–667.
. 2014. PEAR: a fast and accurate Illumina Paired-End reAd mergeR. Bioinformatics 30: 614–620.
. 1981. Identification of common molecular subsequences. J. Mol. Biol. 147: 195–197.
. 2013. Convergent antibody signatures in human dengue. Cell Host Microbe 13: 691–700.
. 2011. R: A Language and Environment for Statistical Computing. R Foundation for Statistical Computing, Vienna.
. 1988. T-cell antigen receptor genes and T-cell recognition. Nature 334: 395–402.
. 2000. Increased cell division but not thymic dysfunction rapidly affects the T-cell receptor excision circle content of the naive T cell population in HIV-1 infection. Nat. Med. 6: 1036–1042.
. 2002. Reevaluation of T cell receptor excision circles as a measure of human recent thymic emigrants. J. Immunol. 168: 4968–4979.
. 2010. Tracing thymic output in older individuals. Clin. Exp. Immunol. 161: 497–503.
. 2010. Estimating human age from T-cell DNA rearrangements. Curr. Biol. 20: R970–R971.
. 2010. Estimation of T-cell repertoire diversity and clonal size distribution by Poisson abundance models. J. Immunol. Methods 353: 124–137.
. 2008. Sparse production but preferential incorporation of recently produced naive T cells in the human peripheral pool. Proc. Natl. Acad. Sci. USA 105: 6115–6120. 1998. Replicative senescence in the immune system: impact of the Hayflick limit on T-cell function in the elderly. Am. J. Hum. Genet. 62: 1003–1007.
. 2006. Naive and memory cell turnover as drivers of CCR5-to-CXCR4 tropism switch in human immunodeficiency virus type 1: implications for therapy. J. Virol. 80: 802–809.
. 2015. Lymphocyte maintenance during healthy aging requires no substantial alterations in cellular turnover. Aging Cell 14: 219–227.
. 2013. T cell replicative senescence in human aging. Curr. Pharm. Des. 19: 1680–1698.
. 1997. Modeling T-cell proliferation: an investigation of the consequences of the Hayflick limit. J. Theor. Biol. 186: 117–129.
. 2005. T cell development and receptor diversity during aging. Curr. Opin. Immunol. 17: 468–475.